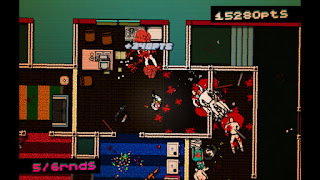 Hotline Miami is a game that I picked up when it was given away for free on PlayStation Plus in October 2013, 5 months after it was released on PlayStation 3 / Vita which was released on PC on October 2012. 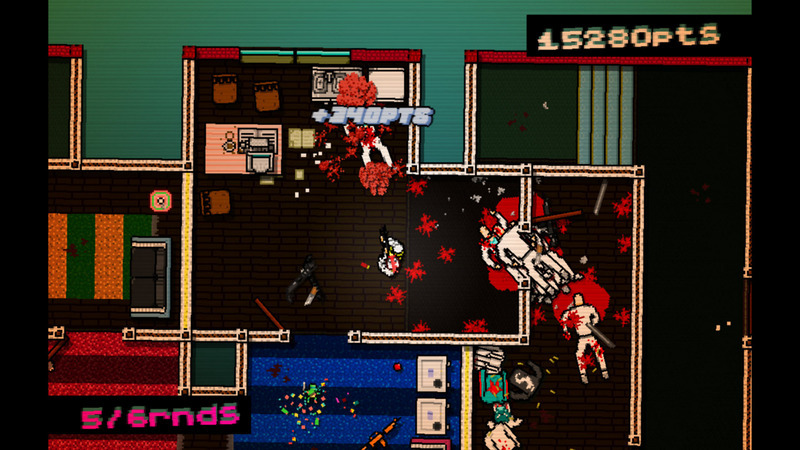 Hotline Miami is a twin-stick shooter where you control your characters with the left analog stick and aim with the right analog stick from a top-down perspective. L will pick-up / toss your weapon, R will fire your weapon / swipe with your weapon / punch with your bare fist. You lock-on to an opponent by tapping on them on the front touch screen and unlock by tapping an empty area. Also, you can tap and drag on the touch screen to view areas near you so that you can see where enemies are located. The controls are pretty simple aside from the tapping which is odd since you cannot lock-on to enemies while moving / aiming since you need to take your thumb off one of the analog sticks. The story is a bit odd to say the least. You wake up in a room and you hear the phone ring, which you pick up and someone tells you to go somewhere and you have to eliminate all the people at this address. Rinse and repeat for the most part. I thought that overall, the story was pretty forgettable but what makes this game stand out is the gameplay mechanics. It is a very fast paced arcade game, you get points for how quickly you go through a level, how you beat your enemies (whether by guns / melee / weapon), if you execute them (if you perform a ground kill), and by chaining kills by killing a bunch of enemies quickly, you get a combo based on number of kills over a period of time. If you don't kill someone within a period of time, the combo drops down to 0 and you have to restart the combo counter. It all adds to you trying to do as much as you can in the shortest period of time. There are a good amount of chapters within the game (over 10) and within each chapter, there are floors that you need to clear, starting in the earlier chapters with just one floor and going up to four floors in the later chapters. You complete a floor, go to the next one, rinse and repeat. Luckily, when you die, you respawn on the same floor with the weapon that you started with, so at least you aren't starting from scratch. However, this means that if you start a floor with a gun with low ammo, you are always stuck with it unless you restart the chapter completely. There is only load time when you have select a chapter, when you die, press X and you respawn and you are back at it, so the quick load helps with the process. As you progress through the game, there are two types of collectibles, letters and masks. Letters you will find in most levels and they are just a tiny pixel, so they are easy to miss and I just used a walkthrough to get them all. Masks are shattered throughout the game and you can obtain them by doing well on certain chapters or finding them in certain chapters. 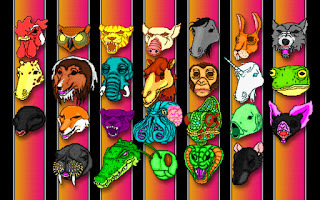 At the start of each chapter, you pick a mask that you want to use and you are stuck with it for the entire chapter, so choose wisely. Each mask comes with a different perk, such as 'move faster', 'more ammo', 'punches kill', 'combos last longer', etc. Also, as you progress through the game, you unlock new weapons (guns, melee weapons, and throwing weapons) based on your cumulative score through the game. So, as you progress, you will see a larger variety of weapons available within the levels which are randomly generated per level but at their fixed spawning location. I had a lot of fun and frustration with this game due to the frantic nature of how the game is supposed to be played. You can take it slow and go room by room and kill enemies as you see them. However, the AI behind them are random, so some will stumble into various rooms one time, and the next they don't, some will attack you when you open a door, and sometimes they won't. So you can either do it nice and slow (although this will effect your score) or you can try to go quick (but you may end up dying a lot due to enemies you didn't expect). I have finished the game and I thought it was a lot of fun. It trains you well from start to finish, the number of enemies increase, the types of weapons vary, the number of levels increase and overall, it just seems like there is more to take in. It is very graphic and extreme in terms of violence and that may be off-putting depending on your tolerance for violence (ground kills usually involve you bashing in someone's head repeatedly or pouring boiling water on their face, stabbing them with a broken pool cue, etc). Overall, I really enjoyed the title and would recommend it and I look forward to trying #2 when I get a chance. Come back next Wednesday for my Final Thoughts on Mutant Mudds Deluxe for PlayStation Vita.